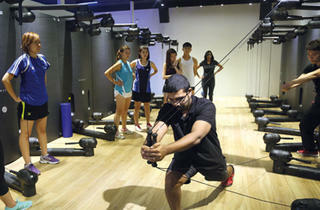 Indie gym Kinetika Xtreme is located more than a little out of the way in Bukit Timah’s Grandstand, and it’s a surprise find among the floors of childcare and kiddie enrichment centres dominating the upper levels of the former horse racing spectator stand. 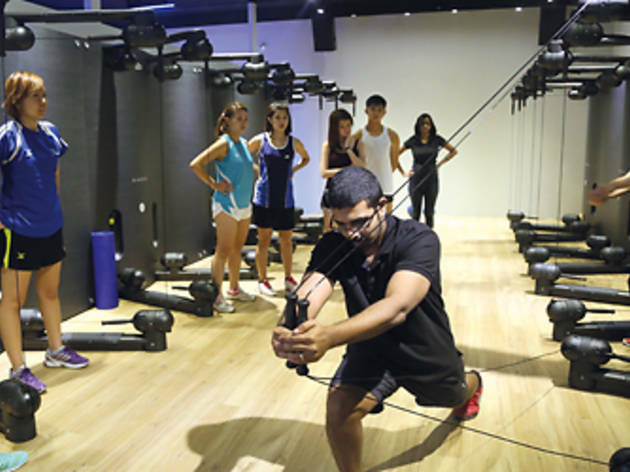 Husband-and-wife owners Ghaneswaran Sukumaran and Santhi Haridass are Singapore’s only certified Technogym Master Trainers, equipped with skills to customise functional training exercises with their collection of Technogym equipment. Their main tools for whipping their clientele into shape are eight sleek Technogym Kenesis machines, used in the gym’s hourlong, signature Kinesis Training classes, which can be gentle enough for rehab work. Brightly coloured balance domes and waterweighted balls, part of the gym’s collection of Technogym Arke kit, are used in varying permutations as part of Kinetika’s Core Centric Training, which promotes strength, flexibility and bodily functionality. Besides its futuristic suite of exercise implements, the gym also offers standard Zumba and Body Combat for off-day conditioning and to provide a more well rounded gym experience.